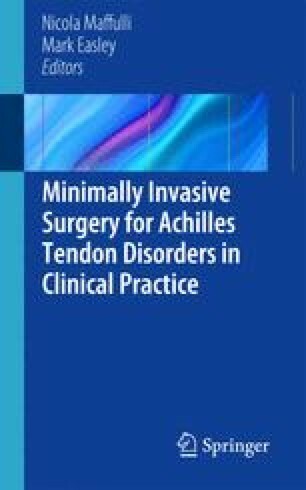 Purpose: To present a minimally invasive technique for the management of chronic Achilles tendinopathy (AT). Methods: Four longitudinal skin incisions each 0.5 cm long are made. Two incisions are made just medial and lateral to the origin of the tendon; the other two incisions are made just medial and lateral to the distal end of the tendon close to its insertion. A mosquito is inserted in the incisions, and the proximal and distal portions of Achilles tendon are freed of all the peritendinous adhesions. A Number 1 unmounted Ethibond (Ethicon, Somerville, NJ) suture thread is inserted proximally, passing through the two proximal incisions over the anterior aspect of the Achilles tendon. The Ethibond is retrieved from the distal incisions, over the anterior aspect of the Achilles tendon. The Ethibond is slid on the tendon, which in this way is stripped and freed from adhesions. The procedure is repeated for the posterior aspect of the Achilles tendon. In addition, longitudinal percutaneous tenotomies parallel to the tendon fibers can be performed, if necessary. Conclusions: This technique has the advantages of achieving a safe and secure disruption of neo-vessels and the accompanying nerve supply in a minimally invasive fashion.